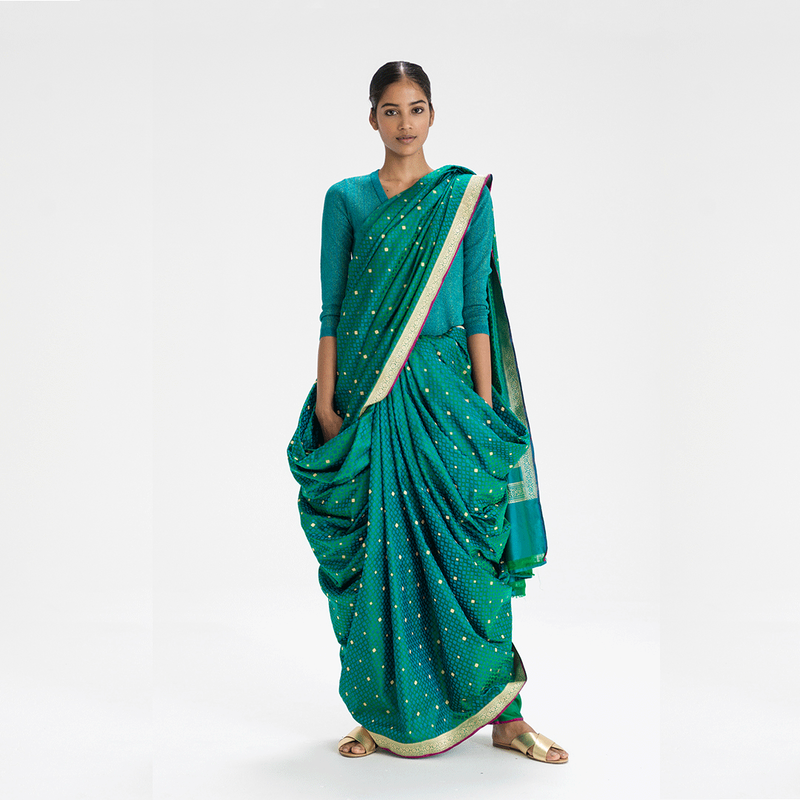 Sari, is a quintessential piece of clothing in every Indian girl’s wardrobe. I am in awe of it and can discuss it until the cows come home! So, here I am once again, this time focussing on Saris & Drapes. 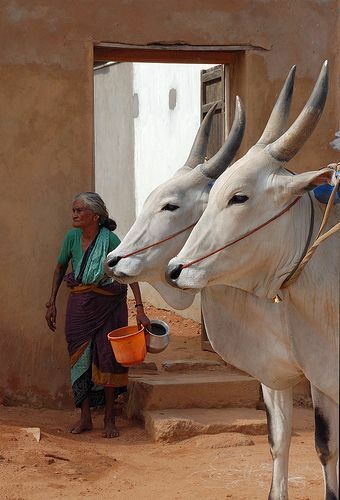 ‘Ulta Palla’ and ‘Seedha Palla’ were the two drapes I noticed most whilst growing up. ‘Ulta Palla‘, (which I recently learnt is referred to as the ‘Nivi’ drape) was and continues to be the most popular style for Ma and other women of my family. However, Amma aka my maternal grandmother loved wearing her sari in the Gujarati style, which was rather the norm for women at the time and this style was known as the ‘Seedha Palla‘. Though both these styles are prevalent today, they are just are a teeny dot in the world of drapes. Border & Fall (a Bengaluru based creative agency) has done a splendid job documenting the regional drapes of the sari in a project ‘The Sari Series: An Anthology of Drape’. I understand this to be a huge database of over eighty different draping styles, that have existed in India for centuries. This project is a giant step towards not just preserving Indian culture but also a platform, where the avid Sari admirer (and user) is presented with a visual reference guide. ‘Ulta Palla’ aka the ‘Nivi’ drape has worked for years, so why the need for drapes we aren’t familiar with? Like everything else, the sari must adapt to the current lifestyle of its user. The ‘Nivi’ drape worked well when it did, with a need for a petticoat aka an underskirt and a fitted blouse and of course, not forgetting the multiple safety pins that ensured the saree stayed in place. A point to remember is that this ‘Nivi’ drape was, and continues to be popular, mainly in the urban areas. Our villages depict a very different picture, when it comes to the sari draping styles. 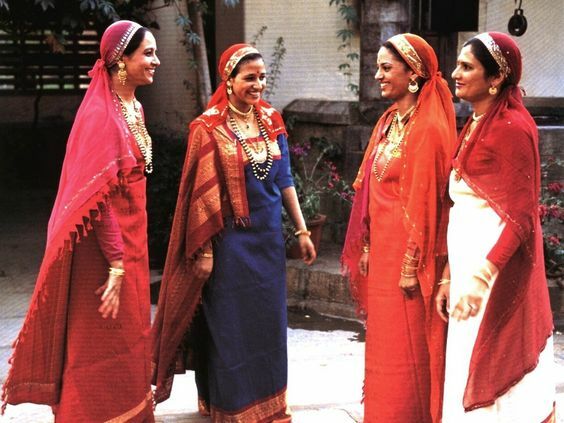 Regional drapes (alternatives to the ‘Nivi’ drape) are prevalent among women in the rural areas. 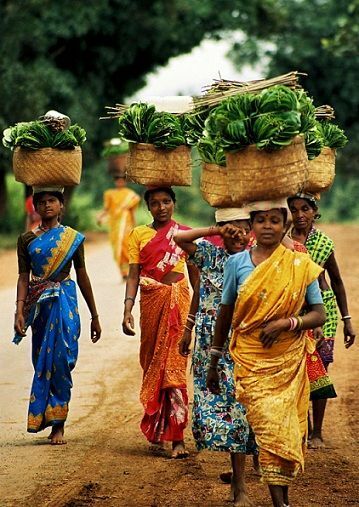 These women are often involved in physical chores such as carrying water over long distances and working with cattle. 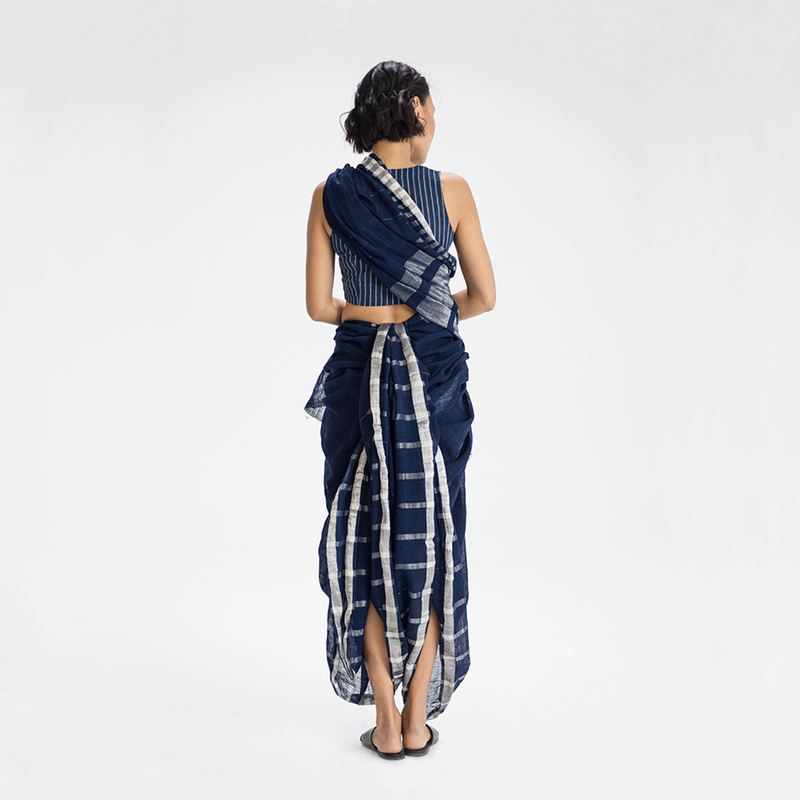 The sari drape has to be practical and must keep them comfortable in the heat and during the chores and, this is exactly what most of the regional draping styles accomplish rather well. It’s worth pointing out here that most alternative drapes to the ‘Nivi’ do not include a petticoat, safety pins and in many cases, not even a blouse! These to my mind are sufficient reasons for us all, leading busy urban lives, to make these alternative drape styles a part of our daily lives too. The more comfortable and practical the sari becomes, the more it will be adopted by the younger generation. Before I sign off, I must remind you to have a little peep into The Sari Series: An Anthology of Drape on Google Arts & Culture #WeWearCulture platform. Let the sari be in sync with your lifestyle; Experiment, Explore and Be Comfortable…Be Notjustashopper!